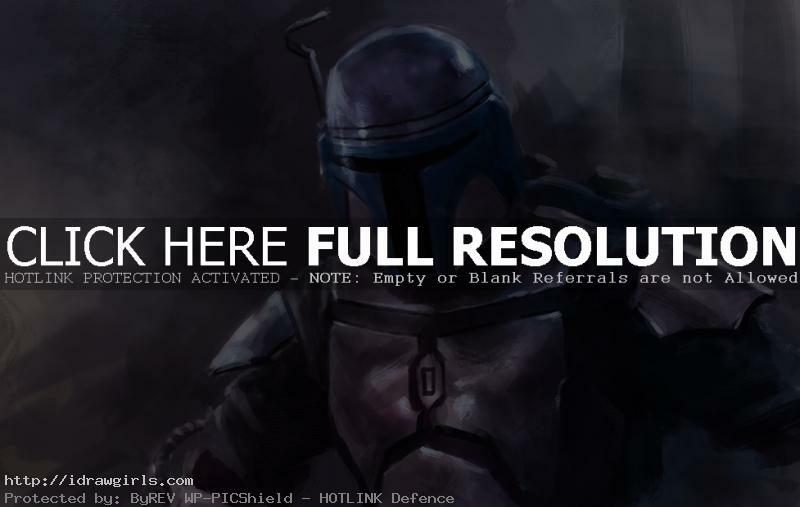 Digital painting tutorial Jango Fett from Star Wars. Learn how to draw Star Wars character, Jango Fett. This video tutorial shows you how to paint a character Jango Fett. I am using Photoshop and Wacom tablet for this illustration. They are the most common tools among most professional concept artist or any digital artists. Another painting tutorial on painting Star Wars characters. You can scroll down further to see step by step images with instruction. 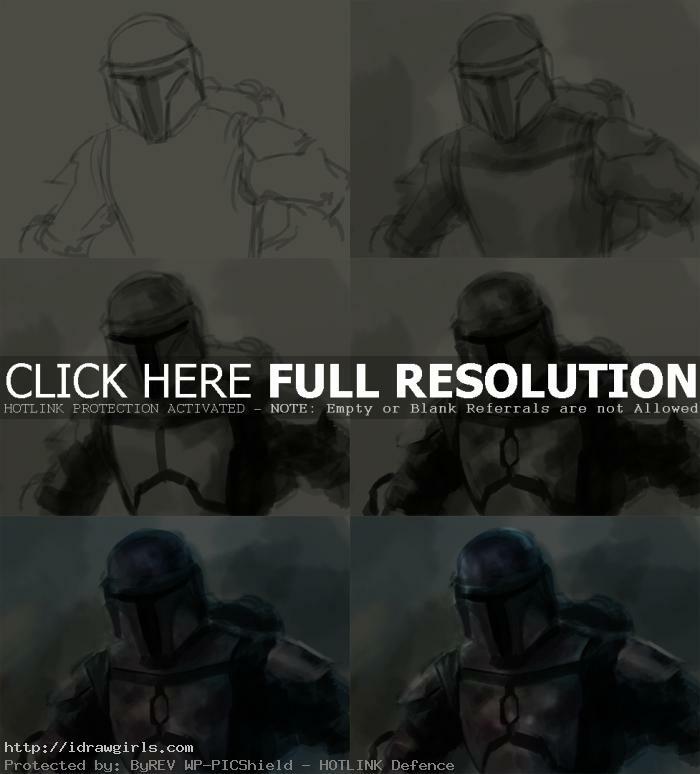 This tutorial we are learning to paint Jango Fett from video lesson and step by step images with instruction. This one takes me about 45 minutes so it is not a finished illustration. Though it didn’t really turn out like I expected. I put a bit too much texture on them metal, I should have make it clean. But that’s just my preference. Still, I did not like how brush strokes turn out on this one. It is just another painting demo. I did the painting for a video demo tutoria, not to be confuse with professionally finished piece. You will learn how to paint a character focusing on light and shadow. We will begin from really rough line drawn, then we will define basic light and shadow. Until we can get the shape and form of the character correctly, then we will start painting with color. At the final stage, we will take advantage of type of edges to give it more punch and depth to your art work. It may look like an impressionist approach but end up with realistic result because of accurate value (light and shadow). This is one of the fastest, efficient and most accurate way to paint. Jango Fett was a renowned human Mandalorian bounty hunter, assassin, mercenary, and the “father” of Boba Fett, a genetic clone of his, whom he raised as a son. Fett became a bounty hunter, quickly establishing a reputation as being one of the best in the galaxy. Later on, Fett agreed to serve as the genetic template for the clones that would form the bulk of the Grand Army of the Republic during the Clone Wars. However, Fett would be central in many facets of the army’s early development, including assisting in the design of the armor worn by the clones, evident in the loose similarities between their armor and Fett’s own Mandalorian shock trooper armor, including the distinctive T-visor of their helmets. Here is a final painting of Jango Fett. 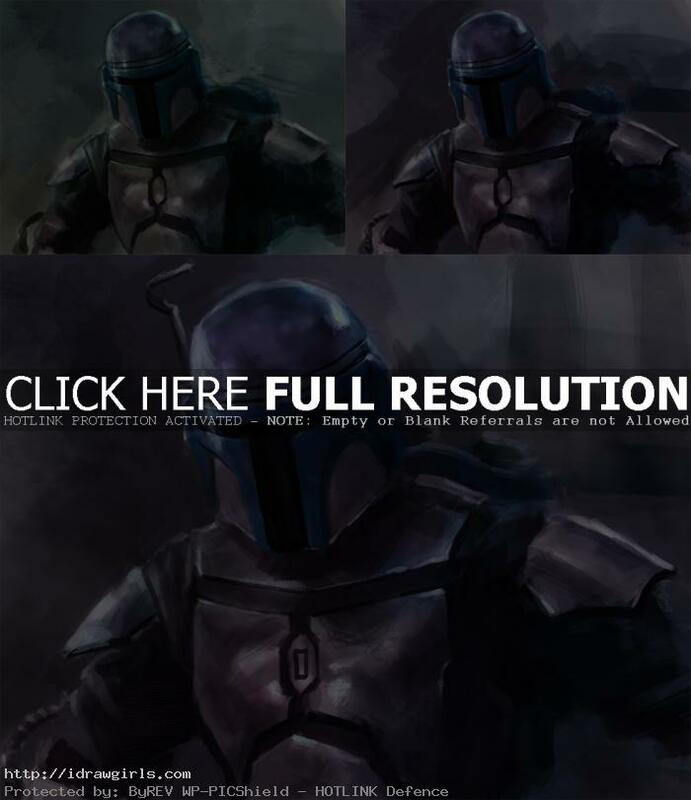 Below are step by step how to paint Jango Fett to use as visual aid along with video tutorial. Step one, I just sketched a really rough head and body. Step two, I then light gray as base for body and background. Step three, I painted in some black to bring up the visual contrast. Step four, I then painted in medium gray to create form using value. Step five, I introduced some color into the piece. Step six, I started to paint his metal material on top of his clothes. Step seven, I brought out the sheen of the metal a bit more using highlight. Step eight, I tested out color using color balance mode. I decided to go with more purple hue because green hue belongs to Baba. Step nine, I added some more hot spot and played with edges. Done! do you have tutorial for beginner dude ? There are some, look around. Thanks ! you have such an awesome site. And your words truly inspire . Thank you so much!! “Be honest and trust your eye because your brain will tell you otherwise. Draw what you see, not what you think the object should look like” I will keep that in mind!! Thanks again!! This is awesome! Im sorry Xia I dont know where to post this message. This is all a bit overwhelming to me this whole digital thing where should I start first . I read what you had to say about the soft and hard edges. That made sense when you compared it to what the eye sees that was awesome explination I caught on immediately . Sorry for the long question I ll get to the point where should I start first?